Bridge, Tab, and Emily are best friends who never fight, but when Em starts trading photographs of herself with a boy, her friends become worried about her. Meanwhile, Sherm is struggling with dealing with his grandfather, who has moved out on grandma. And Sherm and Bridge are toying with starting a relationship of their own. And Bridge still occasionally has trouble coping with the aftermath of a horrible accident she was in when she was eight. And through it all, a mysterious older girl is hiding out at a coffee shop, afraid to be seen now that she's been completely humiliated. 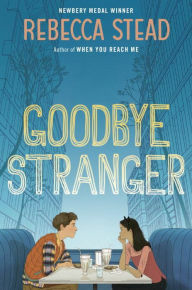 This mash-up is basically the story that Stead is telling in her latest novel Goodbye Stranger, which explores concepts of friendship. It's a difficult story to track and I'm never a fan of that sort of thing. Individual characters are compelling, but jumping around so often when the relationships between them are less than clear is frustrating. By the end, I had to sit back and just let the story take me where it wanted to go, but I didn't really follow it and that left me feeling distant from the novel. In sum, it's pretty, but hard to invest in. I'm reminded of Lynne Rae Perkins' Criss Cross, a similarly hyped YA novel that I found nearly unreadable (Goodbye Stranger, however, is better written! ).